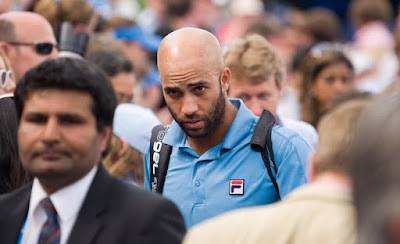 American James Blake advanced to the championship match of the AEGON Championships at the Queen's Club in London when fellow American Andy Roddick retired from the match at 4-4 in the first set because of an ankle injury. When asked about Roddick's injury Blake said, "I think he was hurt before, I saw him pull up." "It was unfortunate, but Andy is such a great player and he doesn't want to endanger the injury anymore. He normally moves so well and you could tell this wasn't the same Andy Roddick." For the title Blake will play Britain's Andy Murray. To a lot of crowd laughter and clapping Blake said, "I realize that the crowd probably won't be behind me, but I have to remind you that I'm half British." When asked if he would ever consider a change Blake said, "I've been asked about that but they (Americans) have been so good to me, I can't turn my back on them." 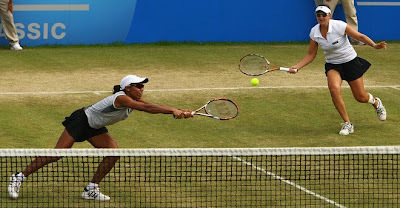 In women's doubles at the AEGON Classic, Americans Raquel Kops-Jones and Abigail Spears defeated Italians Francesca Schiavone and Roberta Vinci to advance to the championship match where they will play Zimbabwe's Cara Black and American Liezel Huber for the title.